All 20 civil rights lesson plans bound together in book form. Encourage your students to think critically about civil rights issues. The 20 lesson plans linked below contain primary sources, classroom activities and discussion questions intended to spark critical thinking. 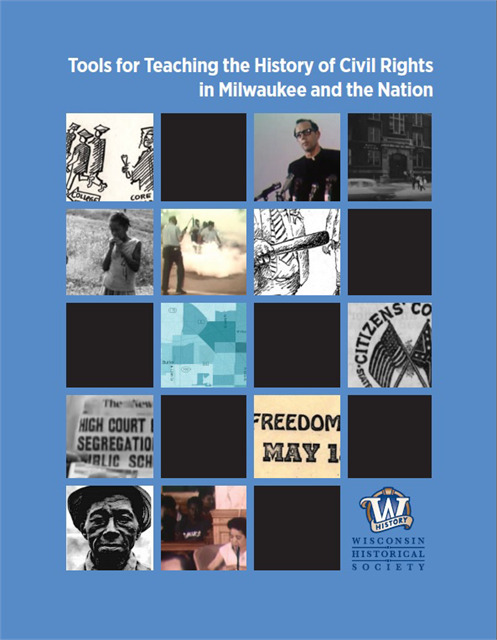 They were originally published in the book, "Tools for Teaching the History of Civil Rights in Milwaukee and the Nation." They are designed primarily for secondary-level social studies and history classes. We present them here individually as editable PDFs so teachers can download and adapt them for their own unique situations. Feel free to click and save them to your own computer for non-profit educational use (any other use requires prior permission). A rich variety of documents are included with each lesson, including newspaper articles, links to video and audio recordings, maps, letters, cartoons, survey comments, photographs, and other primary sources. Most of the documents are taken from the UW-Milwaukee's March on Milwaukee digital collection or the Wisconsin Historical Society's Freedom Summer online archive. Pages can be copied back-to-back with suggested activities, except video and audio clips that need to be played online (links are included). 1. Housing Segregation in Milwaukee in the 1960s. Students examine a map, a statistical table, and a video clip of Father James Groppi to understand the origin of segregated neighborhoods and why fair housing became an important issue. 2. School Segregation in Milwaukee in the 1960s. Students investigate survey responses by black residents and a school boycott flyer to learn about segregated schools and compare them with their own school. 3. Milwaukee School Boycott, May 10, 1964. Students analyze a political flyer and a video clip, decipher their main messages, and try to imagine what they would do in similar circumstances today. 4. Marching across the 16th Street Bridge, 1967. By analyzing a news clip and the text of a law, students learn about the fair housing marches of 1967-68, imagine themselves in the place of participants, and investigate what fair housing means. 5. How Young People Made a Difference in Milwaukee. Students learn how teenagers participated in the Milwaukee civil rights struggle by examining a NAACP Youth Council press release and listening to an interview with a woman who marched as a high school student, 1963-1968. 6. Vel Phillips and the Struggle for Fair Housing. Students watch a 4-minute video of the Milwaukee Common Council postponing action on Alderwoman Vel Phillips's proposed fair housing ordinance, analyze key provisions of the Fair Housing Act of 1968, and debate the conflict between property rights and civil rights. 7. Busing in Milwaukee Schools since 1979. Students examine arguments for and against busing by watching a 10-minute video and analyzing two 1983 letters to the editor. 8. Segregation in Milwaukee Today. Students discover the effects of de facto segregation by examining maps that show race and income distribution. Using the Anti-Defamation League's “Pyramid of Hate,” they identify prejudice in their own lives and imagine steps they can take to change it. 9. Segregation in Mississippi in 1960. Students extract information from a map, a statistical table, and a photograph, synthesize their findings, and reach conclusions about the effects of government-sponsored segregation. 10. Segregated Schools: Winners and Losers. Students compare school segregation in Milwaukee and Mississippi during the 1960s, consider the relationship between knowledge and power, and then reflect upon the value of education in their own lives. 11. Civil Rights, For or Against? Students learn how to identify the main point in an informational text, assess the evidence and reasoning behind it, and decide whether to accept or reject it by analyzing a SNCC pamphlet and a Citizen's Council advertisement. 12. Neutrality or Engagement? Students investigate a political cartoon and a diary entry that highlight risks taken by civil rights workers in the 1960s. Then they do a values clarification exercise to consider how much they'd be willing to sacrifice for an ideal. 13. The Power of Freedom Schools. Students compare conflicting 1964 textbook excerpts about black history, analyze a photograph, and draw conclusions about the value of good schools. 14. Getting the Message Out. Students learn how SNCC managed the media during the civil rights movement, begin to understand marketing and public relations, examine their own media consumption, and write a press release. III. Lessons about pivotal events and issues in civil rights history. 15. Brown v. Board of Education. Students learn about the pivotal 1954 Brown v. Board Supreme Court ruling by watching a PBS video, reading excerpts from the decision, and analyzing a political cartoon. They debate what the proper role of government is in local and individual life. 16. Civil Rights Act of 1964. By rephrasing two paragraphs from the act and analyzing a photo and an advertisement, students learn its main provisions and why those were controversial in 1964. Activities force them to take a side in the conflict between civil rights and property rights and explain their stance. 17. Voting Rights Act of 1965. By analyzing first-person accounts from Mississippi, students discover why the act was needed and learn how literacy tests, harassment, and violence disenfranchised black voters. They then analyze key provisions of the act and speculate about voting rights in America today. 18. Rights In Conflict. Students examine quotes from civil rights laws and statements by a segregationist governor, the Ku Klux Klan, and the white Citizens' Council. Then they take a survey to clarify their own beliefs about the proper role of government in people's lives. 19. Inventing Common Sense. Students examine a 1964 New York Times article quoting white Mississippi residents' on race relations, compare black residents' responses, and dissect an argument about the power of the media. Then they analyze their own media consumption. 20. Civil Disobedience. A classroom activity creates injustice that students discuss in light of an excerpt from Martin Luther King's “Letter from a Birmingham Jail” and two segregationist documents. They are challenged to decide what makes a law just or unjust, what makes an action good or bad, and when civil disobedience is acceptable. These 20 lesson plans were originally published in the book, "Tools for Teaching the History of Civil Rights in Milwaukee and the Nation" (Madison: WHS Press 2015). They were written by staff of the Wisconsin Historical Society's Freedom Summer project: Michael Edmonds, Russ Faulkner, Mary Kate Kwasnik, Lotus Norton-Wisla, Kathryn Sheriff, Samantha Snyder and Emily Swenson. We're grateful for criticism and suggestions provided by the following classroom teachers, educators, and historians: Jasmine Alinder, Matt Blessing, Kathy Borkowski, Linda D'Aquisto, Michael Doylen, Sarah Fallon, Michael Gordon, Kurt Griesemer, Maggie Holtgrieve, Ryan Hurley, Meghan Kobs, Jennifer Koss, and Phyllis Santacroce. Funding to create the lessons and publish the handbook was generously provided by the Jane Bradley Pettit Foundation, the Herzfeld Foundation, the Northwestern Mutual Foundation, C. G. Schmidt, and the Weyco Charitable Trust.